To all that are interested, this first image below is the piece of info (Margaret Brogan married John Broderick From Cappabane/Scarriff/Co Clare, pic below) that I believe will tie us all together, and I believe that all the people I have copied on this email are related. Per Ann Donovan’s emails last November, I understand that Uncle Vince has a family album with pictures of “JJB” (John James Broderick). 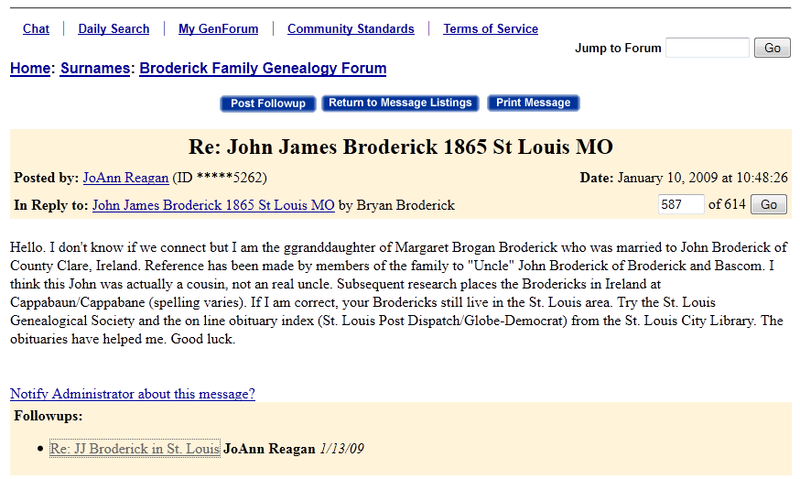 I have also come across a 2009 internet post between Bryan Broderick and JoAnn Reagan that discusses Margaret Brogan, as well as a second post days later that discusses a 92 year old uncle, whom I believe is Vince Reagan. 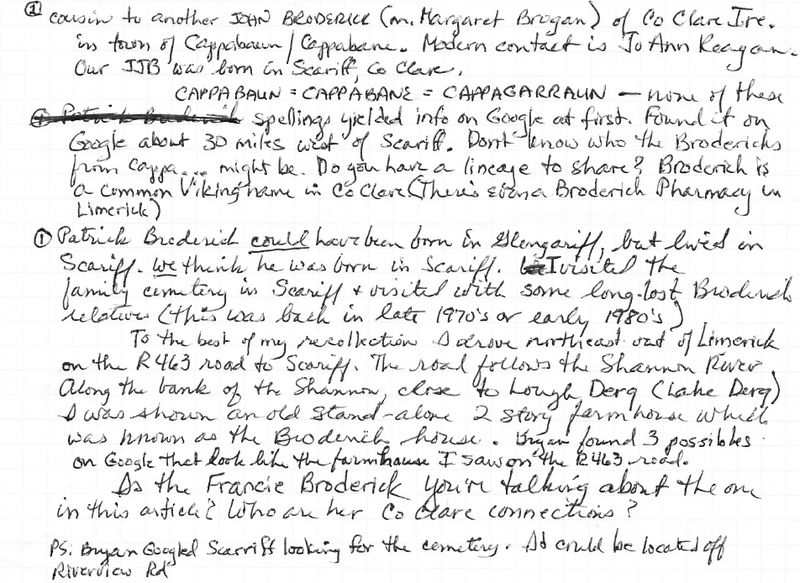 Also in Anne Donovan’s email, James Hawk was married to Mary Broderick (shown here as Maria Broderick). 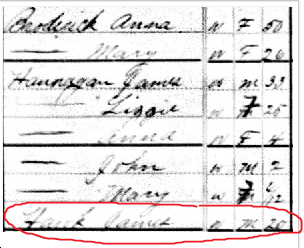 I have a 1880 census showing James Hawk lived with JJB’s sister. This picture states Hawk James male 20 who is living with JJB’s mother (Anna Duggan Broderick), two of JJB's sisters and other Hannagans in 1880. James Hawk was approx 20, and before he married. Since Anna Duggan Broderick was alive at this time, she could also have known James Hawk’s other relatives in Ireland. I found this directory online where James J Hawk was listed as a bookkeeper at Broderick & Bascom Rope Co. The Margaret Brogan family tree above shows the Reagans are related (JoAnn and Vince), the Hawks are related (Anne Donovan and brother John). 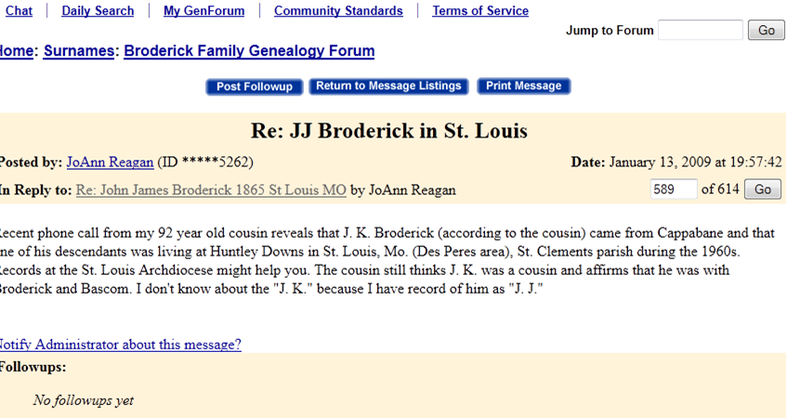 On the other side, we know the St Louis Brodericks are related to JJB (Anne, Beth, John, Paul and 4 other siblings, as well as me Jeanne Broderick Shelton, and Bryan Broderick and Charlotte Hamilton). Also Francie Broderick, from St Louis, has a special connection in that her grandmother came her from Ireland, as I understand it, and JJB of B&B helped her get established. I understand that Francie has a connection also with the Brogans, and has been in contact with the Brogan family in Ireland. I belive all of us are related, and if we go back far enough, I believe we all share ancestors in common. I believe we can draw a line between the two sides given the fact that our JJB pictures are in vince’s album. James Hawk lived in 1880 with our side of the family, Anna Duggan Broderick, JJB’s two sisters et al. 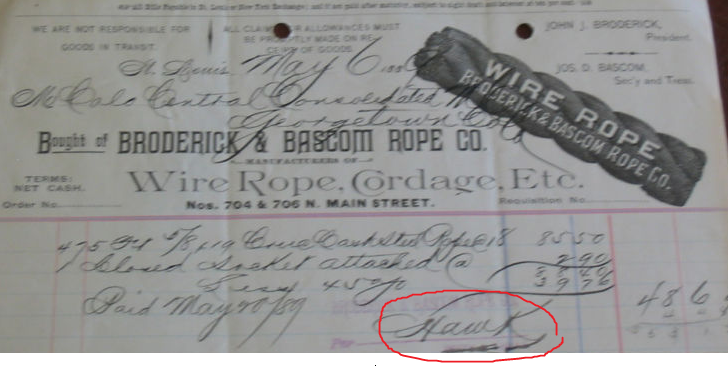 And that James Hawk worked at B&B and signed the 1889 invoice. Since these facts and supporting documents bring the two sides of the family together, I am very hopeful that I can take information from our side and information from the Hawk/Reagan side, and help us to find our relatives in Ireland, and the relatives we have in common. 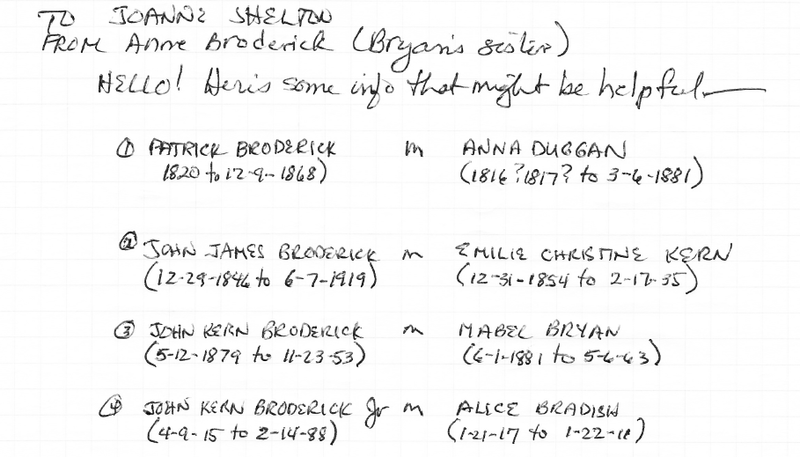 I think it is very funny that Anne Donovan now lives within a mile or so from where the 8 Broderick siblings grew up (note my father explains half the house at 5 Hill Dr was in Kirkwood and the other half of the house was in Glendale). Note to all, I am very much looking forward to making contacts with John Hawk (Anne Donovan’s brother), JoAnn Reagan, whom I have not been able to find any contact info, and finding out what Vince Reagan can add to this search for us, especially his family album with our family photos in it. If anyone copied on this email can help me to make these contacts, I most appreciate anything you can do so that we can pull all of our resources together and find the proof of our ancestors in Ireland. Fortunately those who know well the Brogan line can trace their ancestry to Ireland. However, for the rest of us Brodericks, we are relying only on your information (Anne Donovan, John Hawk, JoAnn Reagan and Vince Reagan) that you can pass along to us. Your help will most certainly be appreciated. I am very interested to see what all of you think about this. I just find it so fascinating. ----- FABULOUS ----- recorded conversation with Vince Regan about his understanding of the family history. Note Vince kept referring to John K Broderick as if he was John James Broderick (aka JJB) who immigrated to St Louis from Ireland in 1849. Vince was thinking of the man he had met when he was younger, JJB's son JKB. I am looking again at the family tree and putting these pieces together. I sent an email to try to reconnect to Anne Donovan and hopefully I can connect to John Hawk or JoAnn Reagan. I did find this very interesting. 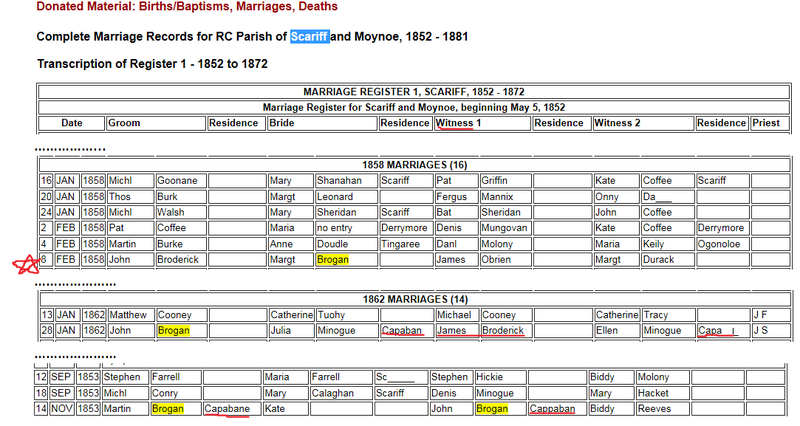 It is the 1858 Ireland record of the marriage between Margaret Brogan and John Broderick. Note it is very difficult to find actual documents prior to the 1860s in Ireland. James Hawk married Mary Broderick (born Maria). It is her family that takes us back to Ireland. Interestingly her branch immigrated, stayed a while, then half of them went back. Hopefully I can further find out their relatives that went back. Anne mentioned her uncle Vince Reagan and gave me his phone number. She said he had an album with JJB's pictures in it. I have not been able to locate that album. However, I had an hour long voice recorded conversation with Vince, which I have played a couple times. He passed away a couple of years ago. He was able to tell me where JoAnn fit on his tree. That was exciting to be because I had found a 2009 online posting between our Bryan Broderick and JoAnn Reagan regarding this entire connection. Surely wish I could get ahold of her. Ugh. John Kovarik contacted me last year. He is on our tree too. His mother is Lucille Broderick. It was thru John that I found out in 2014 (around the time Charlotte was going to Ireland) a huge piece of the puzzle for me. Kovarik showed me this article that is in the Broderick & Bascom Strand publication. It mentioned that John J Broderick (1864-1936) was related to our JJB, and he worked for 50 years at B&B. this article was in John Kovarik's mother Lucille's important papers. I furiously looked thru the B&B encyclopedias and sure enough it is in the Strand publications. So I recall having a phone conversation with Francie Broderick (of Places with People on Lindell in St Louis). I specifically recall that Francie told me that the Brodericks lived on neighboring land to the BROGAN family. And that lots of Brodericks and Brogans married. So that is how I have tied all of this together. Once I saw that Margaret Brogan was married to John Broderick, and then saw their daughter married James Hawk who worked at B&B and lived with our JJB's mother and sister…..i know we have this tied down now. Whew. That's a lot of goodies right there. Now I need to really press on and try to get ahold of Francie Broderick. Apparently she moved to Texas, but I do not know her husband's name or where she moved. Broderick being her middle name, I may never find her. Say a prayer for us! And if anyone knows how to get ahold of JoAnn Reagan either that could be a huge help! I think it is very important to point out the resesarch done in the family prior to my interest. Most of our early knowledge about the Broderick family comes from Mary Broderick Chomeau. She was passionate about documenting our family history. She did interview her elders and take very detailed family notes. She passed these on to Anne Bryan Broderick, who then sent me Mary Chomeau's hard work, along with lots of goodies, possibly around 2012.
part one below is specific to the John Kern Broderick Jr family. However, part two goes much farther up the tree and is very important to all of the U.S. Brodericks from St Louis. Anne notes above that she located the family cemetery, and she contacted her brother Bryan to place this on the map. I have a message to Bryan Broderick to see if he remembers where this could be. I dont recall where she discussed RIVERVIEW, but i put it on the map anyways. 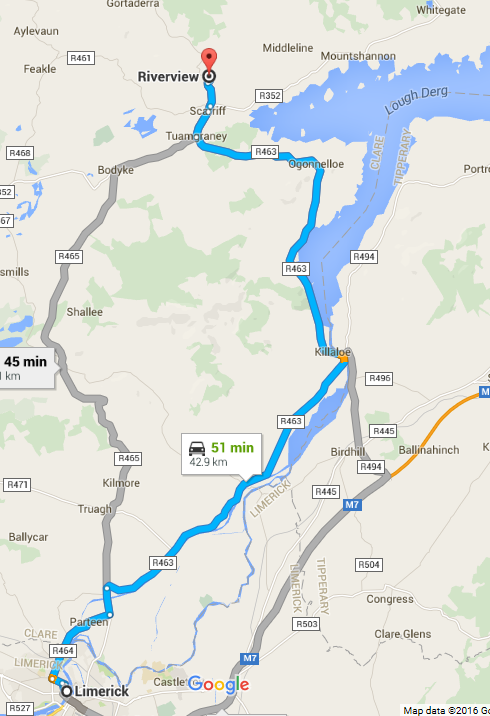 This general area is where our Brodericks were from, and i believe north of Lough Derg as well.